My mum reminded me (as gently as only a grandmother waiting for photos of her grandson in costume can) that I promised to post some photos of Espen in his Halloween costume, and here they are! 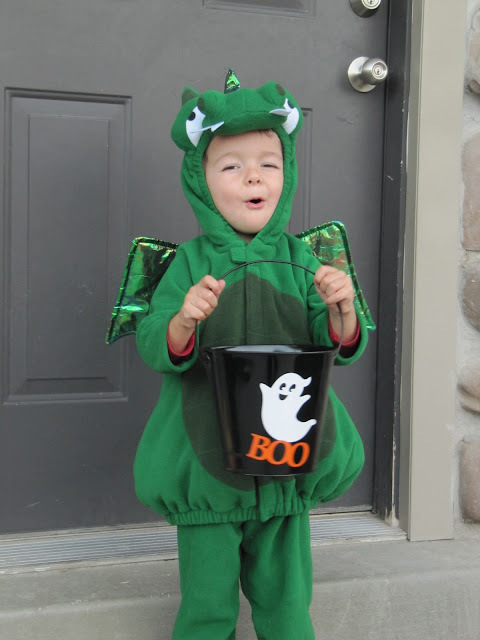 This is the first year that he's been old enough to really catch on to what we do on Halloween, and he voiced his tiny two year-old opinion in September when he told us he wanted a dragon costume for Halloween, which he has stuck to ever since (although he did spend a few days telling people he was going to be a baseball...?). Knowing that this was not the year to start spending quality time with my sewing machine, we went with a pre-made option from Old Navy ($8 on sale!!!) and were all pretty delighted with the result. I like that it's warm and pretty functional, Espen likes that it has wings and a tail. Behold! This is a roaring face. As it turns out, it was pretty tricky to get a non-roaring photo of Espen while he was "in character." And another roar for good measure. Trick or treating was really fun. Espen really caught the vision and would knock on doors and say "trick or treat" to anyone who would listen to him. It was a little trickier to get him to remember to say "thank you", but we have a few years to get that one nailed down. 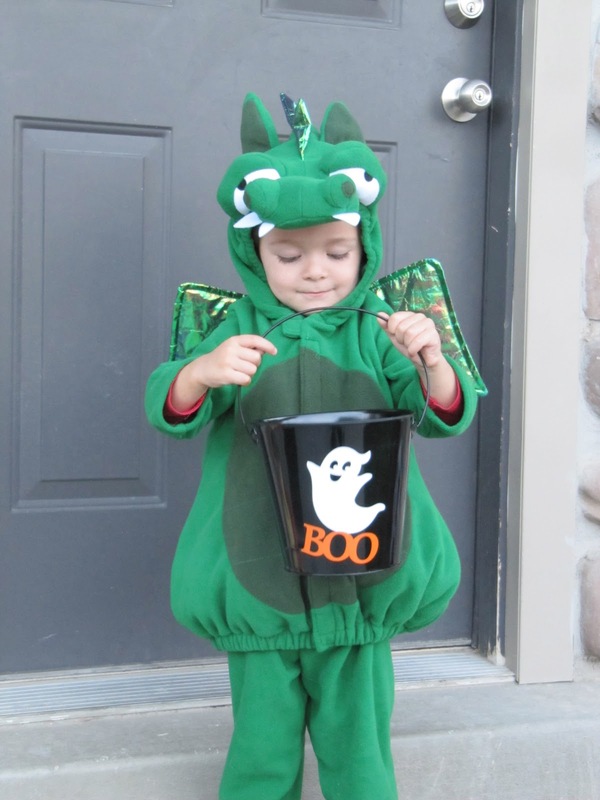 Most people are willing to forgive sketchy manners in two year-olds, especially if they're yelling "Happy Halloween!" at the top of their tiny lungs. Our only real Halloween misadventure was that we got sidetracked by some good friends that we hadn't seen for almost a year, so we didn't make it home until most of the trick-or-treaters had come and gone, and are now stuck with a huge pile of candy. Oh, the sacrifice! And now that Halloween is over, it's officially November, and we are having a baby in 20 days. Crazytown. hands down my favourite Halloween costume I have seen, $8?! Adorable. And appropriate since it's the year of the dragon in Chinese astrology.